Japan Airlines has led the world in on-time performance, according to OAG, a provider of flight information. Some 85 per cent of the carrier’s flights arrived on time last year, closely followed by All Nippon Airways, with 84 per cent, and Delta Air Lines, on 83 per cent. UK-based British Airways and easyJet also rank in the top 20 for annual on-time performance of the world’s largest airlines, according to the results of the OAG Punctuality League 2018. The report placed the two UK-based airlines at 10th and 15th respectively amongst the world’s largest carriers: BA with 79 per cent and easyJet with 75 per cent of flights both departing and arriving on time. The 2018 report also places easyJet in the top 20 low-cost carriers for punctuality, while Europe-based airBaltic took the top spot as the most punctual airline in the world, with over 90 per cent or planes arriving on time. John Grant, senior analyst at OAG, said: “BA and easyJet are certainly holding their own amongst their global counterparts. 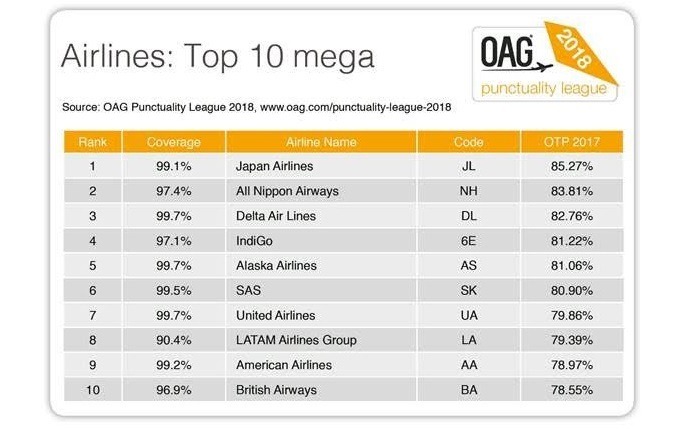 The 2018 OAG Punctuality League is based on approximately 57 million flight records using full-year data from 2017 to create the best performers in an expanded range of categories. To qualify for inclusion in the OAG Punctuality League, the OAG Schedules database must have received at least 80 per cent of all scheduled flights to and from an airline. OAG’s sample is based upon the ‘sum’ of arriving flights within 15 minutes of scheduled time as supplied to OAG and included in its database.